Oaxaca (wha-ha-ka) cheese is a delightful semi-soft, stringy, cows-milk white cheese that could be best compared to mozzarella! The Oaxaca cheese is a stretched, curd cheese that is formed into a ball, often resembling a softball in size, that you can shred for the gooiest of dishes. All of the quick info above being said, why not make a quesadilla inspired by the southern Mexico state! To keep with the flavors of the real SOUTH of the border, I have decided to incorporate other commonly used ingredients from Oaxaca while infusing it with a couple of my own. Plus, I just really NEED steak in my life, but by all means, make this a veggie’dilla if you wish! STEAK: In a gallon zip lock bag or baking dish/bowl, combine the meat with the marinade ingredients; toss and massage to coat. Zip up or cover and let sit for 30 minutes on the counter or 2-3 hours in the refrigerator. When ready to eat, remove the steak from fridge about 20-30 minutes prior to cooking. Cook the steak (medium-high heat on the grill or cast iron pan on stove) till desired doneness. Let rest for at least 5 minutes or more. Cut across the grain into thin slices. QUESADILLA: Heat the canola oil and butter in a large sauté pan, over medium-high heat. When melted and butter is slightly browned, add in the onion and sauté about 3 to 4 minutes. Add the serrano (or jalapeno) and chopped garlic and cook until fragrant, for about a minute. Next add in the sliced mushrooms and let cook down for 3-5 minutes, letting the juices come out, which will in turn allow them to dry out. Follow that with the fresh spinach leaves and salt. 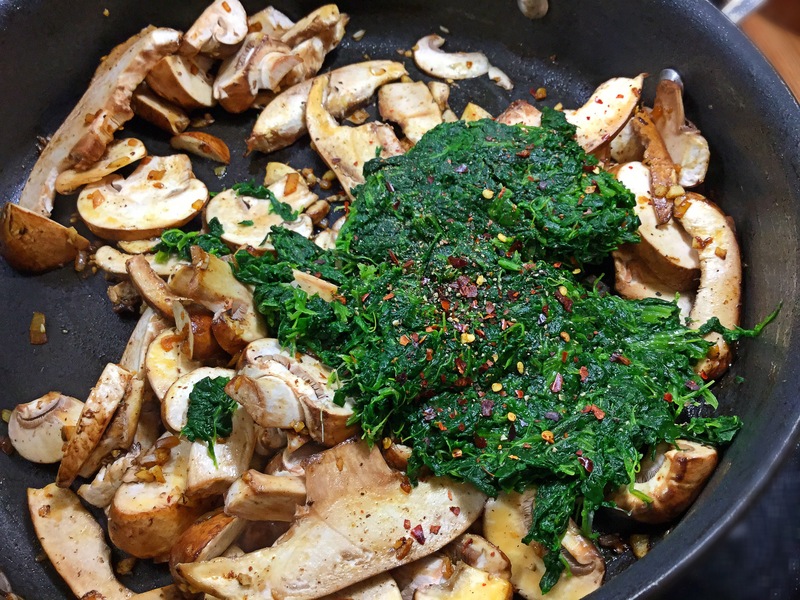 Continue to stir and sauté until mushrooms and spinach have wilted and the mixture is not too wet, but not too dry. ASSEMBLY: Again, whether grill or stove top pan, heat to medium and place a tortilla into a dry pan and warm/char (30 seconds). Flip tortilla over and start to layer the 2 cheeses, the sliced steak and the mushroom-spinach mixture over half of the tortilla (I also added a bit of sliced avocado to this), fold in half and cook a couple minutes until golden brown. Flip and cook the other side till browned and cheese is gooey! SERVE: Place on a platter and cut into wedges (pizza cutter!! ); serve with your choice of accompaniments. I chose pico de gallo, a crunchy cabbage slaw, cilantro, Mexican crema and salsa! Enjoy!! Whether you’re hosting a ladies brunch, a dinner party or would just like to elevate your weeknight dinner with an EASY, yet impressive meal…this recipe will do the trick! The sweet and savory flavors are just outstanding! You also have creaminess from the brie, sweetness from the roasted grapes and cranberries, freshness from the spinach and a nice crunch from the apples, pecans and browned tortilla. Flavor sensation bliss! …And don’t you dare say that you “cannot cook” or it sounds “too hard” or “too fancy”. You can and it’s neither! 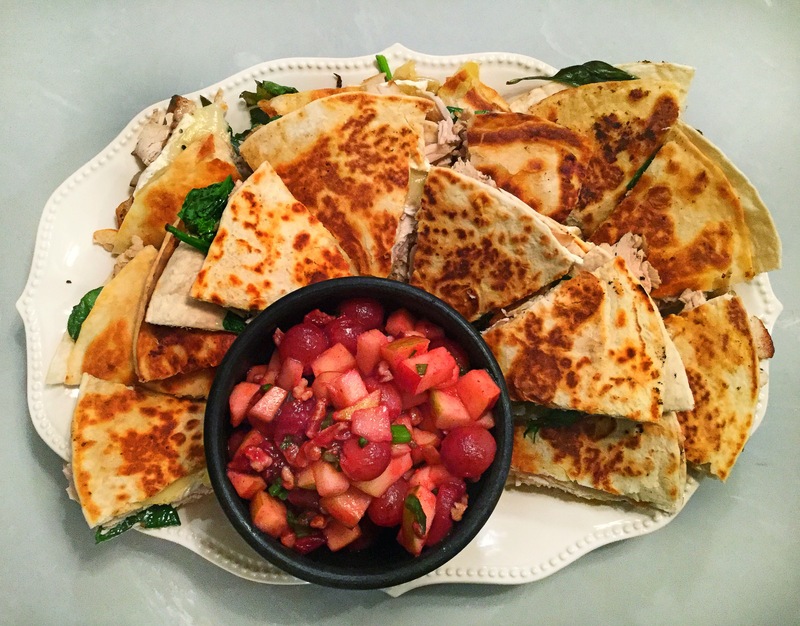 This entire recipe will take less than an hour to prepare whether you use it for a meal or an hors d’oeuvre.p at your next get together…and who can’t slap together a flipping quesadilla, because that’s exactly what it is! *the Pico de Gallo can be made ahead of time and refrigerated until use. *I recommend the best, quality deli roasted turkey. My local grocer here in Texas, HEB, actually rotisserie’s whole turkeys and I have them slice up one pound on a number 2 setting. Begin this simple, but oh so fancy tasting recipe by preparing the sweet pico de gallo…preheat your oven to 375 degrees and line a small baking sheet with foil. While the oven is preheating you’ll begin to caramelize the onions. 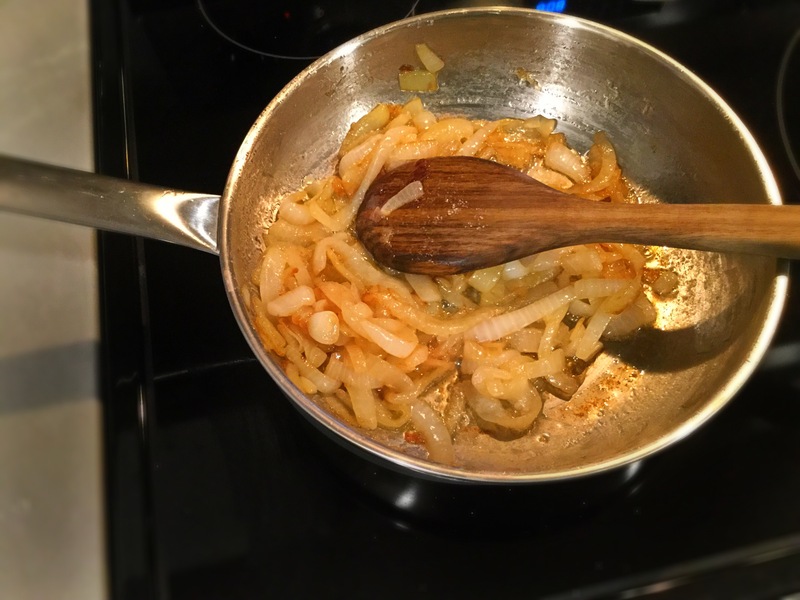 In a sauté pan over medium low heat, place the sliced onions and 3 tbsp butter (plus a pinch of salt and sugar) and allow to cook down till soft and that beautiful caramel color. Meanwhile…. 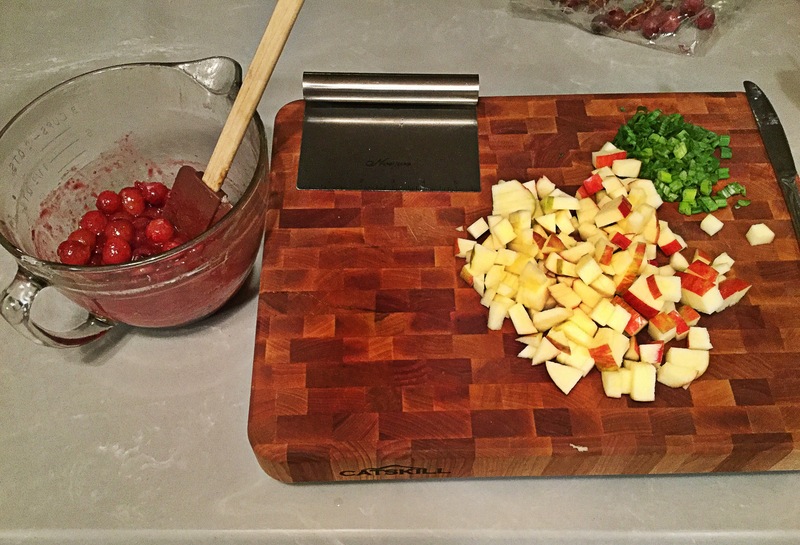 In a large bowl, gently fold together the grapes, cranberries (again, completely frozen here is just fine), 1 tablespoon of the honey, 1 Tbsp melted butter and 1/4 tsp of the cinnamon. Pour onto the baking sheet in a single layer. Place in the oven and allow to roast for 20 minutes. To the cooled, roasted fruit: add the apples (I like to chop right before to avoid browning), green onions, pecans, jalapeño (optional) and remaining 1 Tbsp of honey and 1 tsp of cinnamon. Toss gently to coat together. In a small bowl, whisk together the Dijon mustard and the honey. Assembly time!! Preheat a large skillet to medium heat and add 1 tbsp of butter to melt. On each tortilla, spread 1 Tbsp of the Dijon-honey mixture on one side and lay (uncoated side down) into the hot pan. Top half of the tortilla with the sliced turkey, spinach, brie slices and the caramelized onions. Fold in half and allow to brown; flip to brown the other side. Repeat with remaining ingredients. Makes 4 filling quesadillas. Allow to cool for 2-3 minutes and using a pizza cutter, slice each browned quesadilla into 4 triangles. Place the slices on a large platter along with a bowl of the Roasted Apple Pico de Gallo for garnishing…enjoy!! The warmer months are upon us where no one wants a heavy meal and eating a reoccurring plate of grilled chicken over salad can get old. 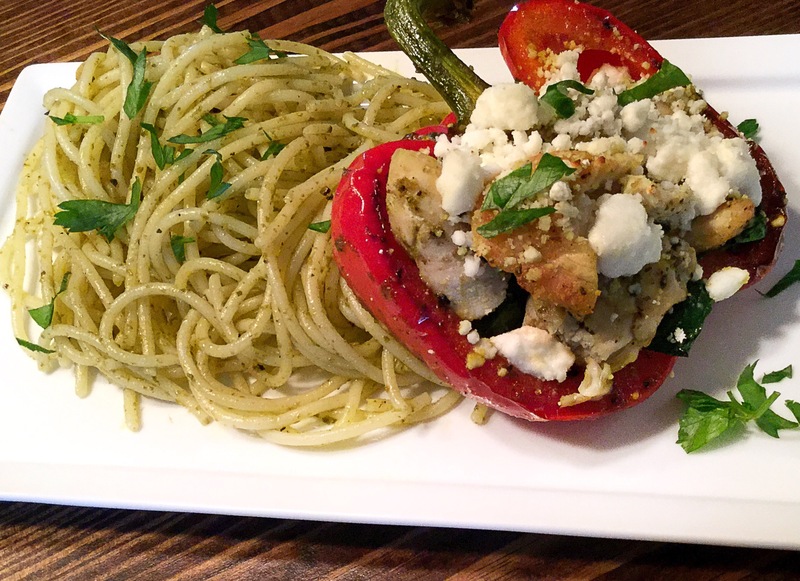 Now this dish isn’t much different, it still has grilled chicken and vegetables, but it’s put together in a beautiful way with extra flavor from a basil pesto and goat cheese crumbles. Still light and pretty darn healthy! Another fun thing about this recipe is it can be done in your kitchen OR take it al fresco and do this ALL on your backyard grill for a fun, light dinner! 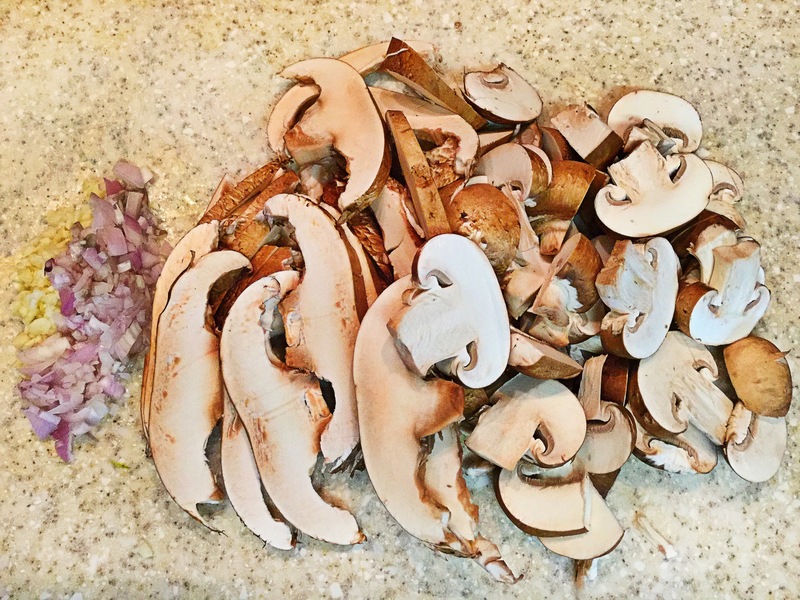 *I like to serve this either with: pasta tossed in the remaining pesto, with a pich of kosher salt & fresh ground pepper OR if I’m on the grill…I just grill up some more veggies! Especially fresh asparagus, mushrooms, etc. 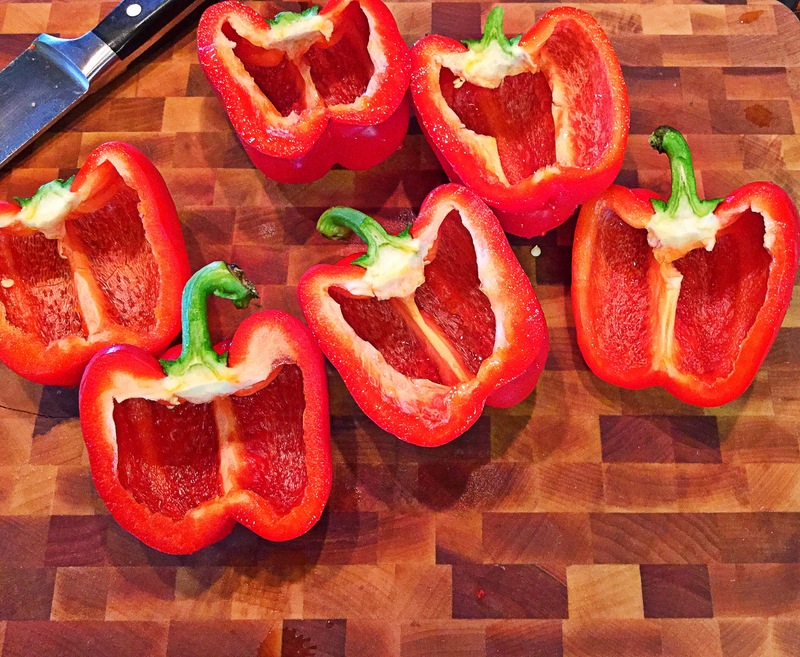 Begin by preheating your oven to 425 degrees and rinsing, cutting in half and removing the seeds of the bell peppers. 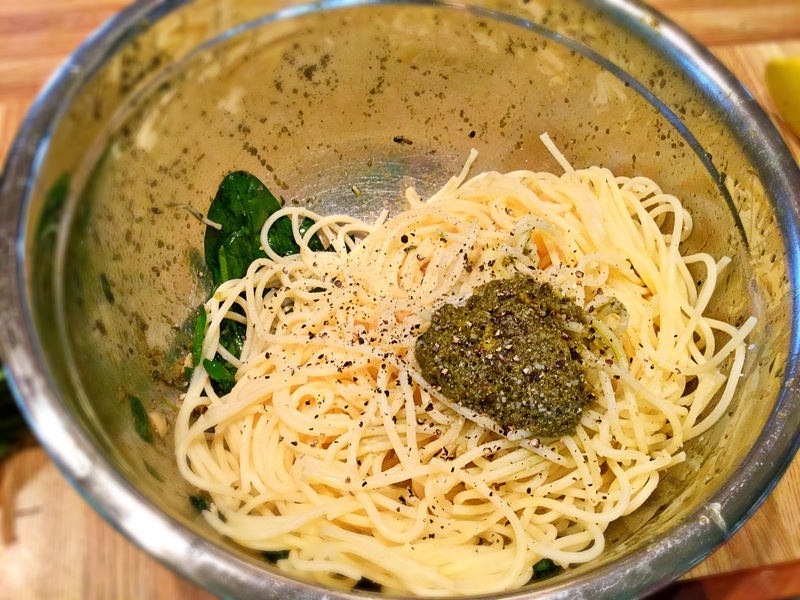 In a large bowl combine about 1 Tbsp of EVOO along with 2 Tbsp’s of the basil pesto. Toss the cut bell peppers in the mix. 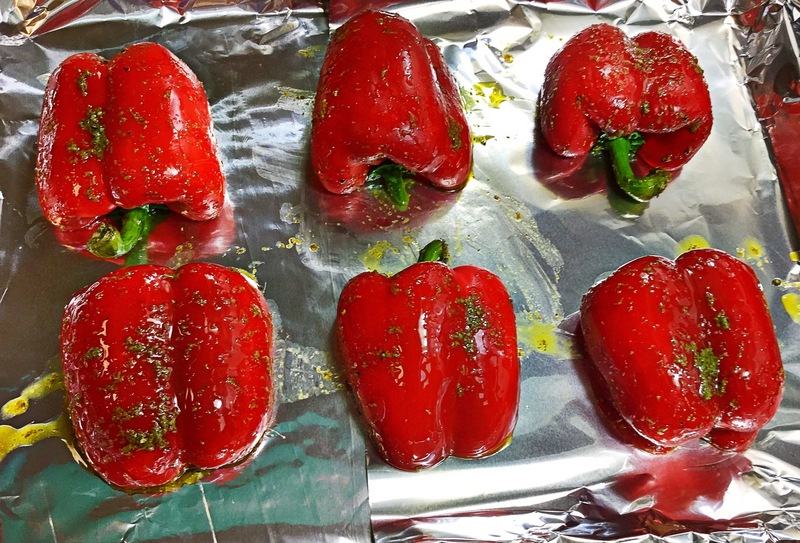 Lay the coated peppers cut-side down on a baking sheet and sprinkle a pinch of kosher salt & ground pepper over the tops. Roast in the oven until just slightly soft (the skins start to bubble), about 10-15 minutes. Remove from oven and set aside. *Keep the oven on, but you can drop the temperature to 400 degrees. 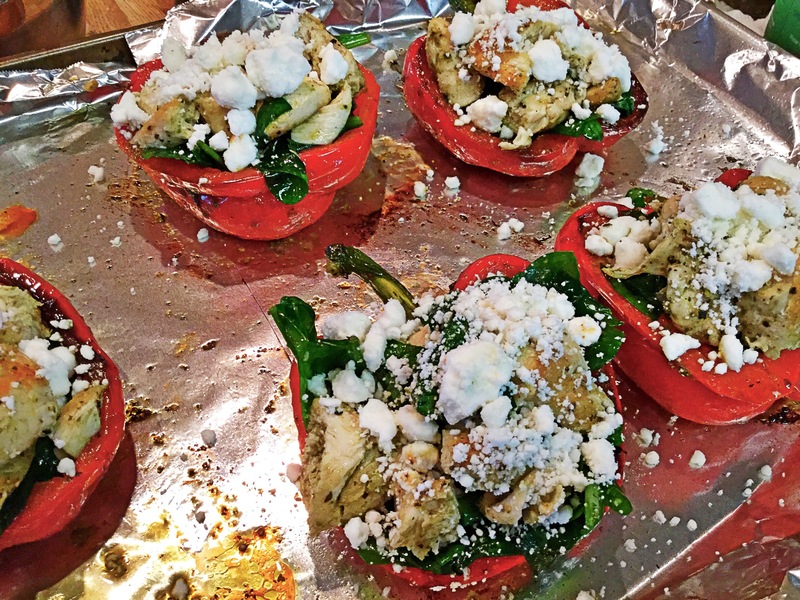 While the peppers are roasting you can prepare the chicken and spinach. 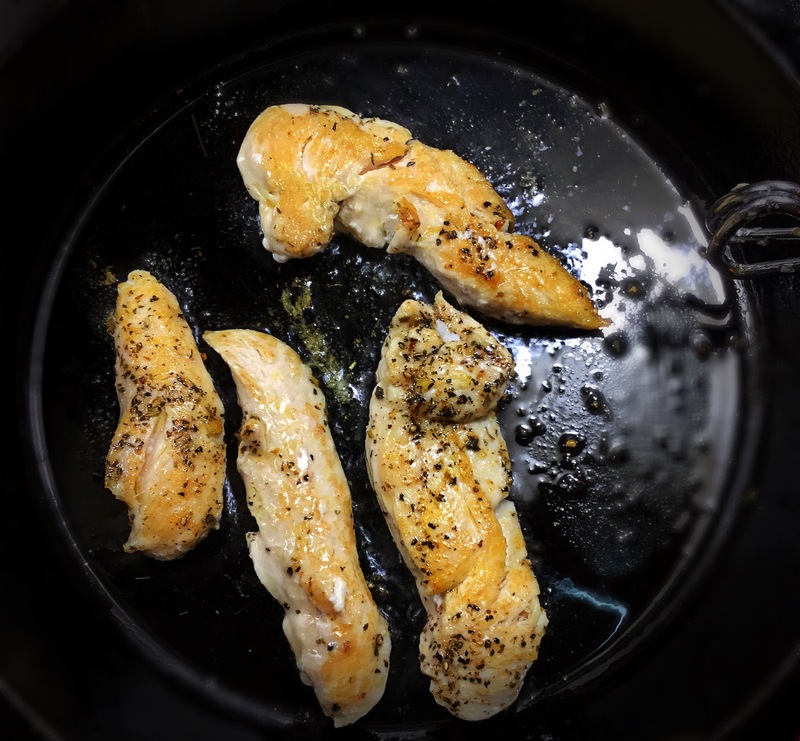 Heat a pan with a bit of oil to medium-high heat while coating the chicken also with a tbsp of pesto and salt & pepper. Cook/grill the chicken for about 4-5 minutes per side, till just cooked through (I had thin strips, so please cook accordingly), and has a nice golden-brown crust. 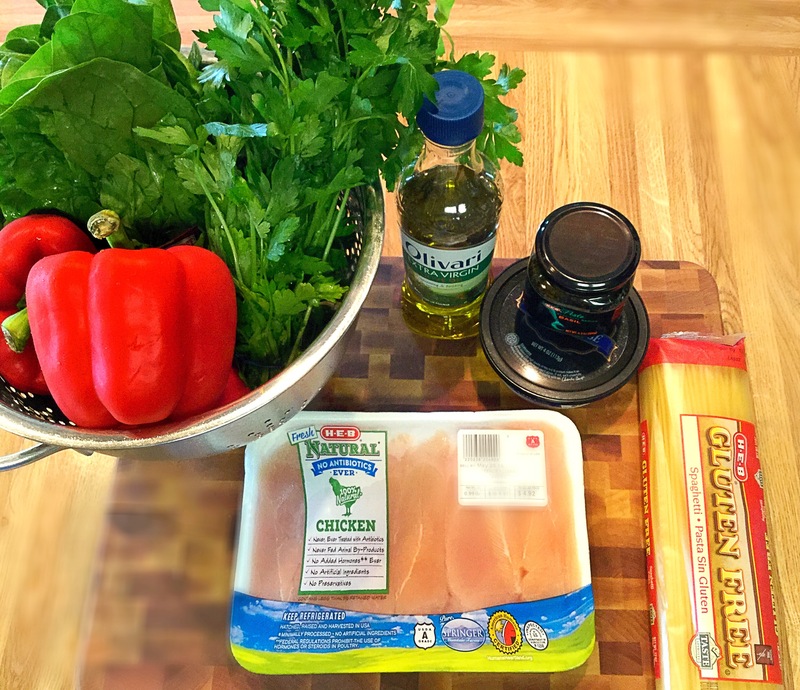 Also, rinse the spinach and chop off the hard stems (don’t worry if you miss a couple) and place the cut spinach into the same pesto bowl that the bell peppers where in. 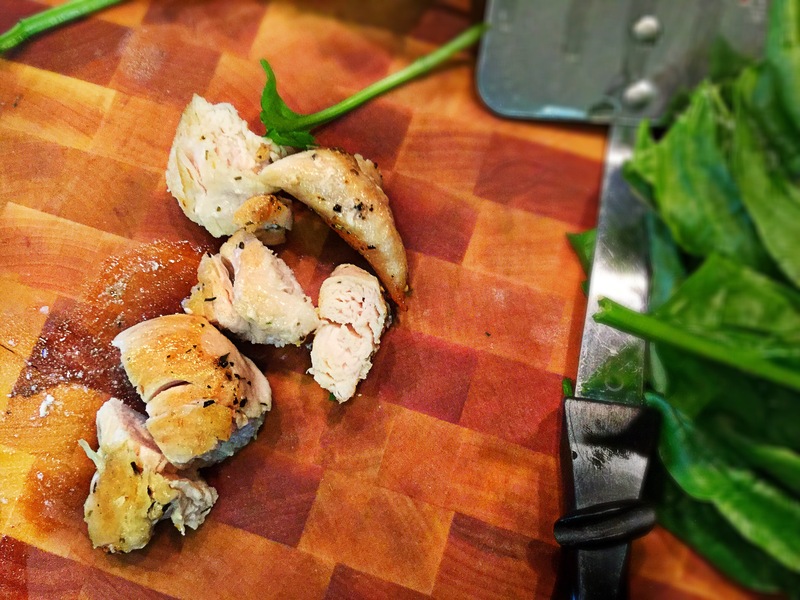 As soon as the chicken is done cooking, remove to a cutting board and chop up. 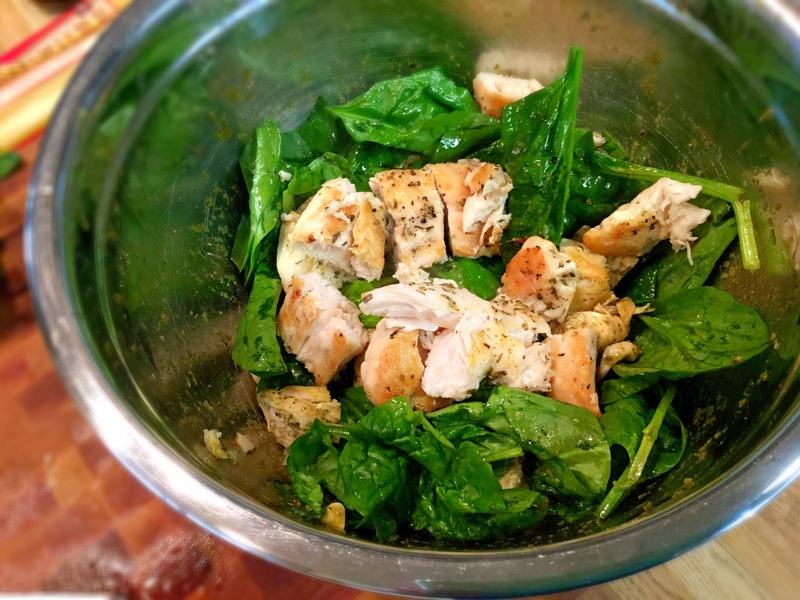 Immediately tossing the hot, chopped chicken into the fresh spinach. 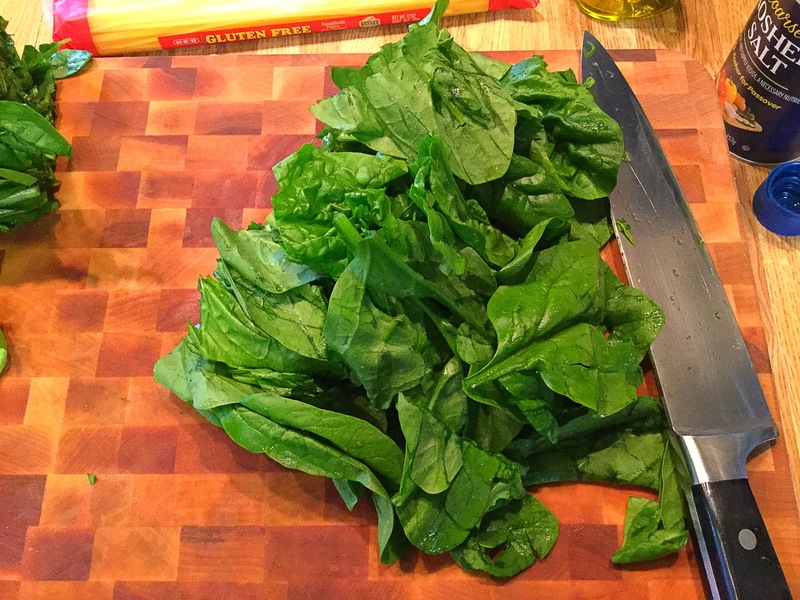 *The hot chicken will help to wilt the fresh spinach. Again, add a pinch of salt & pepper and another Tbsp of pesto. …I promise you, this will not be too much of a basil flavor. Assembly time!! 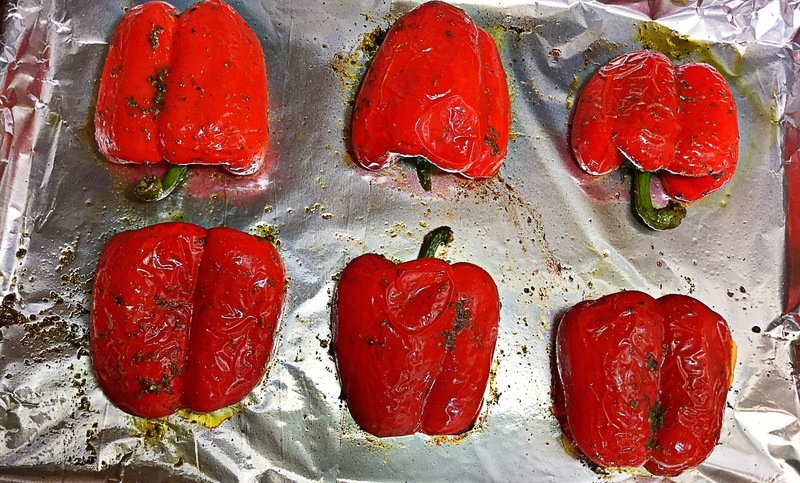 Bring over the baking sheet of roasted red peppers and fill with the pesto-chicken-spinach mixture. Next, take a good amount of the crumbled goat cheese and sprinkle over top. *I like a lot, so I press that goat cheese in there! 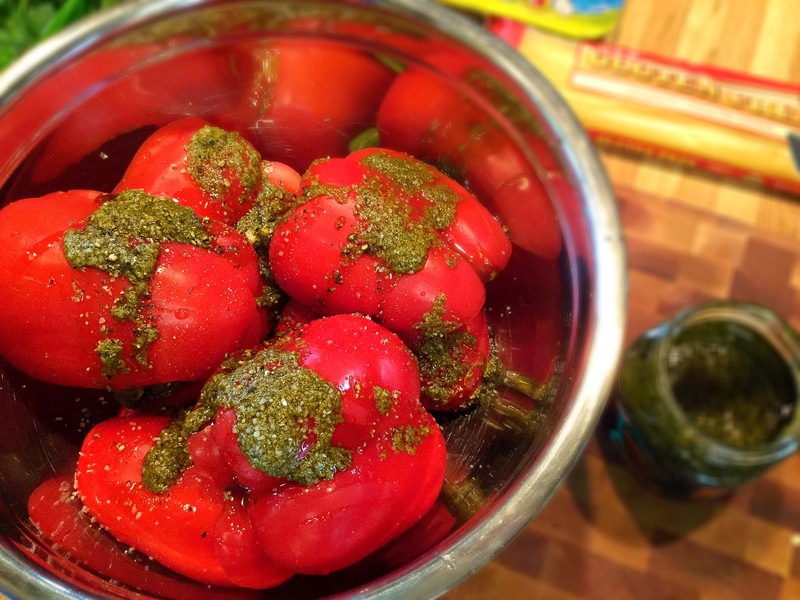 Finally, pop these stuffed peppers into your preheated oven for about 5-7 minutes. Remove and serve with a side of pasta or fresh, grilled vegetables. Enjoy! 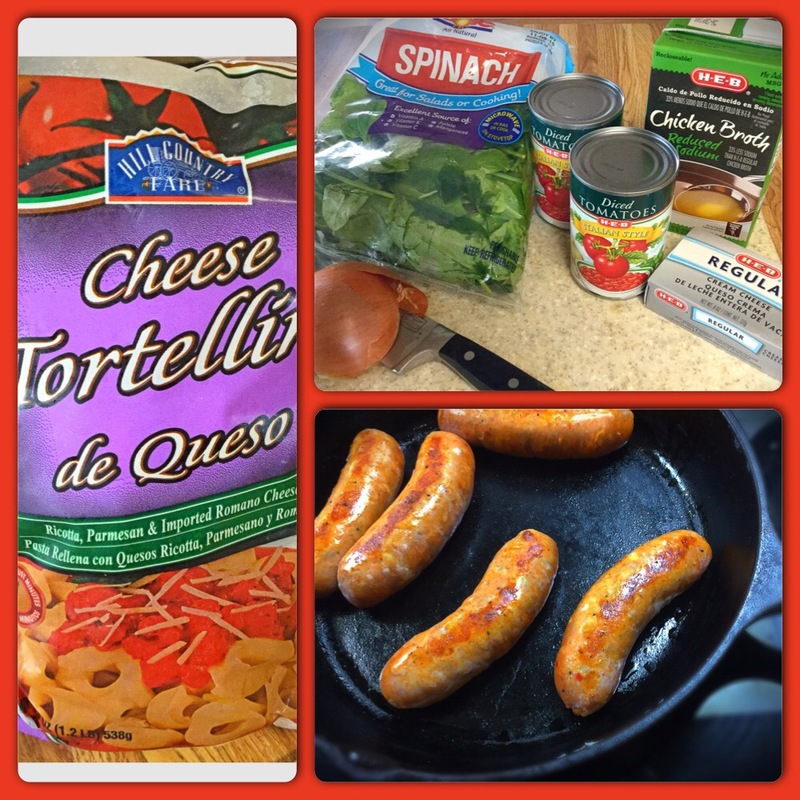 I must be feeling “off” because instead of (my favorite) Mexican food…I was having an Italian craving! So I loaded up the crew and headed to the store in search of something that’d catch my eye! 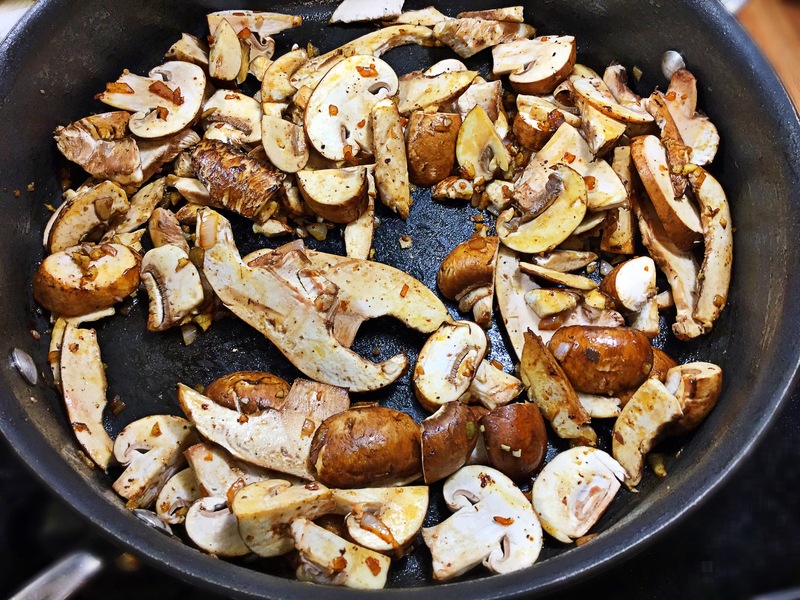 Once in the produce section, I saw aplenty of fresh mushrooms, and while their meaty texture would of been fine alone for me, I KNOW my hubby needs meat in his meals. So let’s head for the Italian Sausage!! In true Carly form I went with the spicy..hey, even my young boys love it! 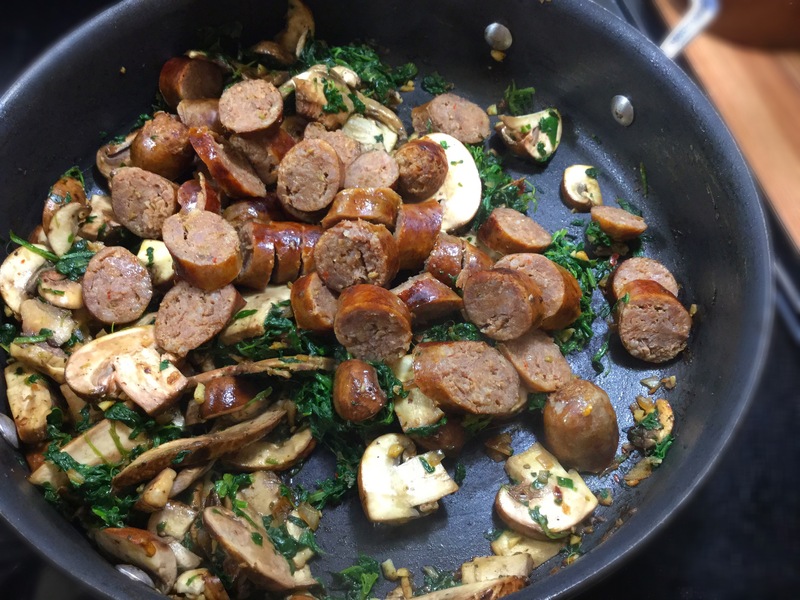 Finally, what goes better with sausage and mushrooms in not only flavor, but color? Sautéed spinach!! 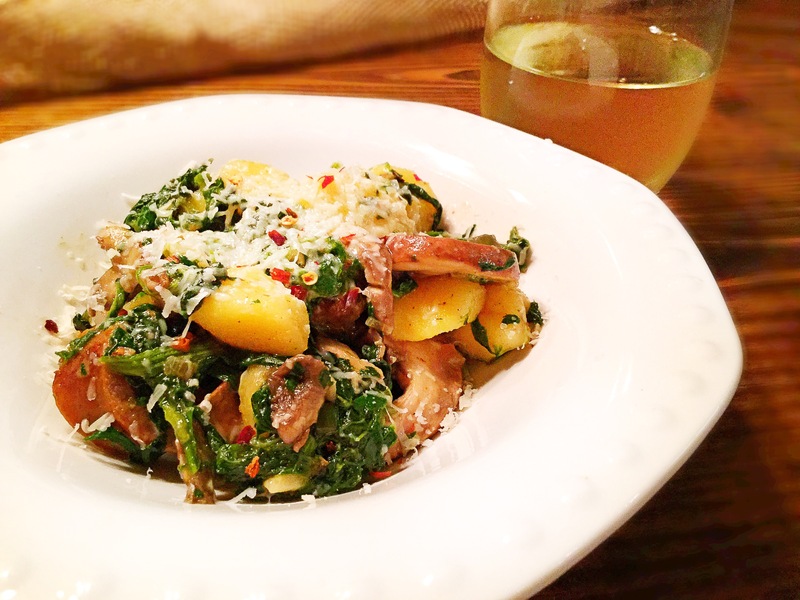 Dang, when paired with the onions and garlic, the light pillowy texture from the gnocchi (Im dreamy eyed right now), this was just delicious!! **plus quick!! *This can be made gluten free. 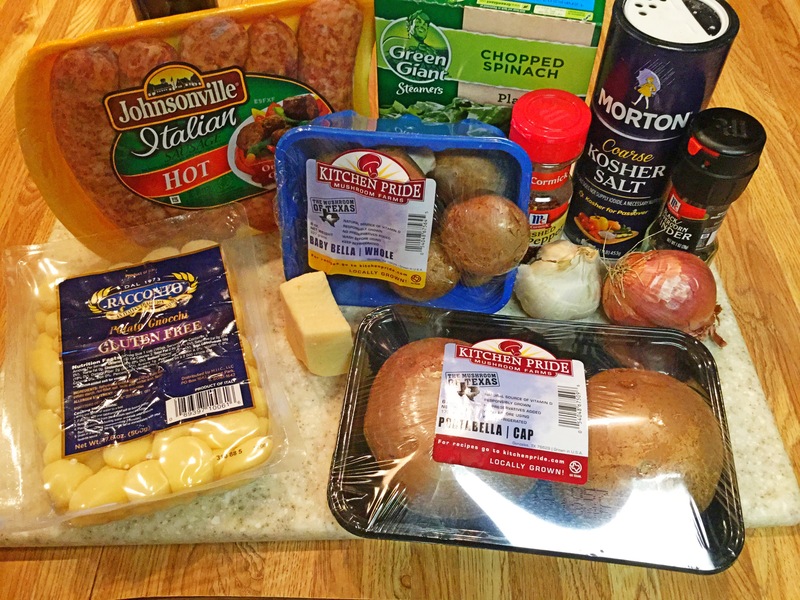 *You can leave out the sausage and substitute veggie broth instead of beef stock for a vegetarian option. 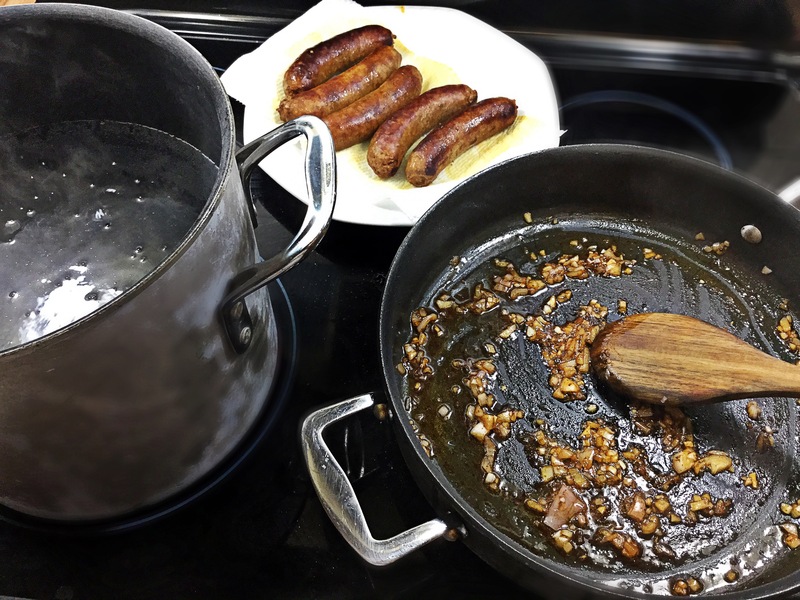 In a large skillet on medium heat, place in the Italian sausages along with a couple Tbsps of water. Cover and allow to brown, turning ever so often. 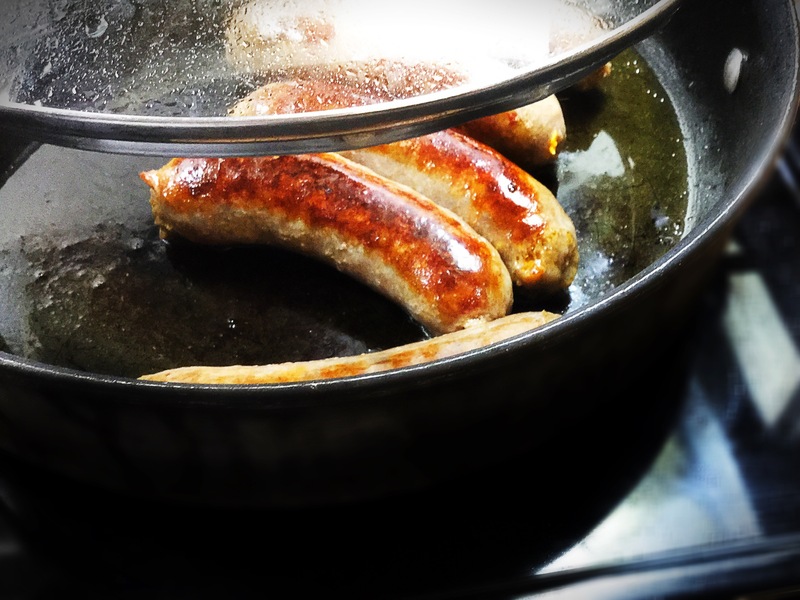 Once the sausages are browned on all sides, remove most of the grease and then carefully poor in the 1 cup beef stock over the sausage. Cover again and allow to steam in the broth for about 5 minutes to finish cooking through. When finished, set aside on a paper towel lined plate reserving the pan juices. **Meanwhile bring a large stockpot of salted water to a low boil. In that same pan with the reserved juices, add in the garlic & shallot and cook for 1 minute. 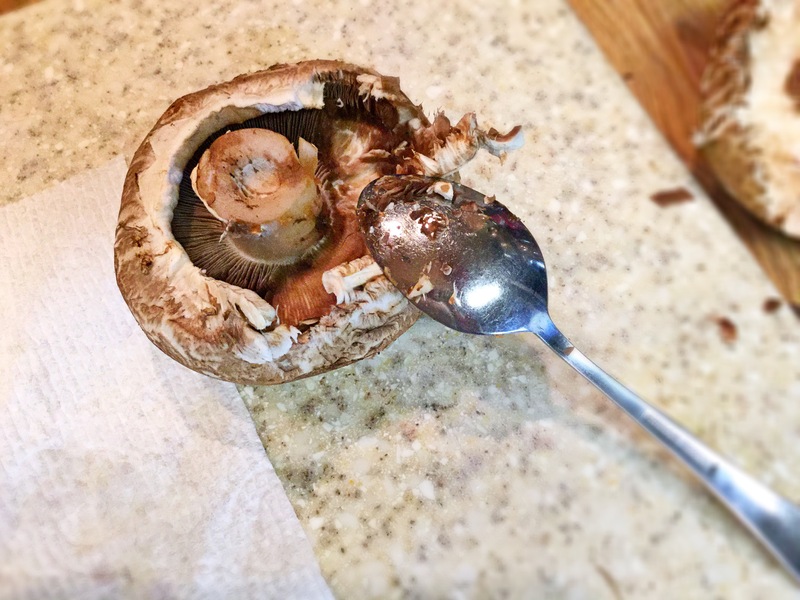 Next, toss in all of the mushrooms followed shortly with the defrosted & drained spinach. 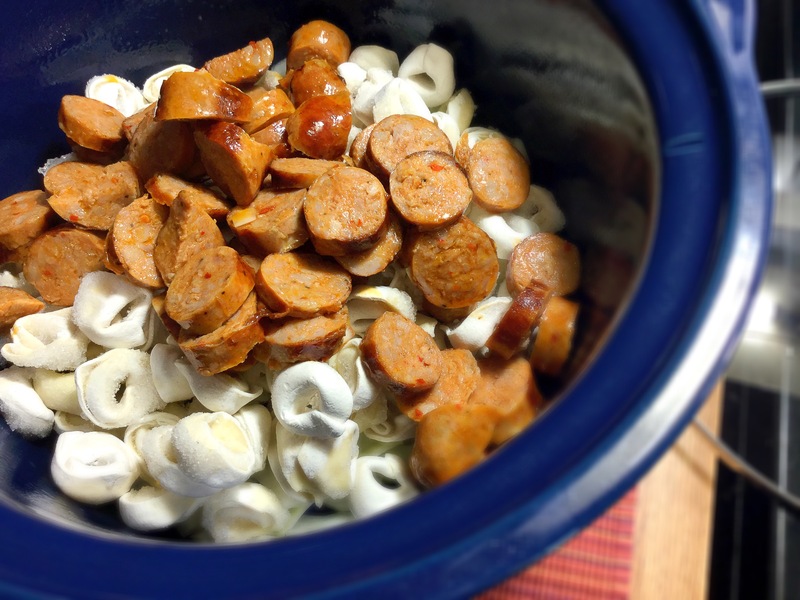 Sauté the veggies together while slicing the now cooled and cooked sausage links into 1″ pieces. Add to the skillet. 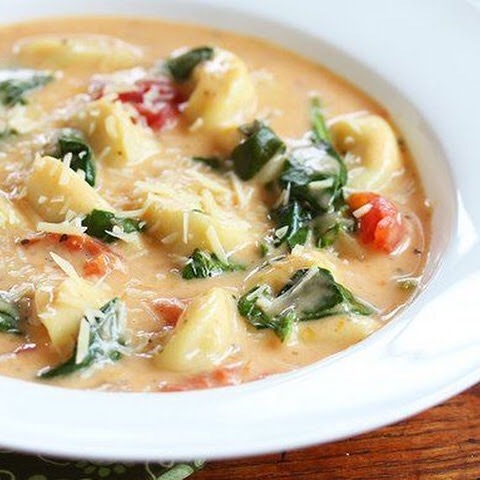 **Your water should now be boiling, so toss in the gnocchi and cook to package directions. This does NOT take long folks. Gnocchi is now cooked! 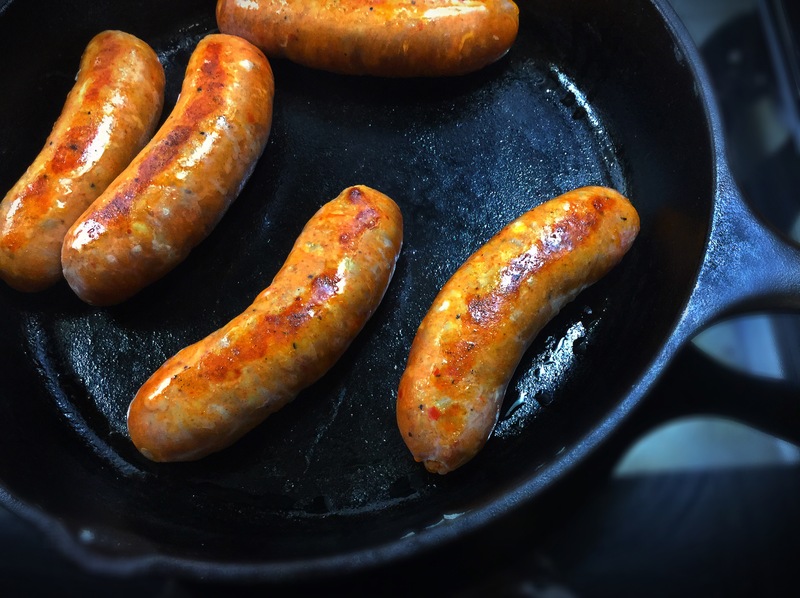 With a ladle transfer the pillowy potato bites directly into the sausage skillet. 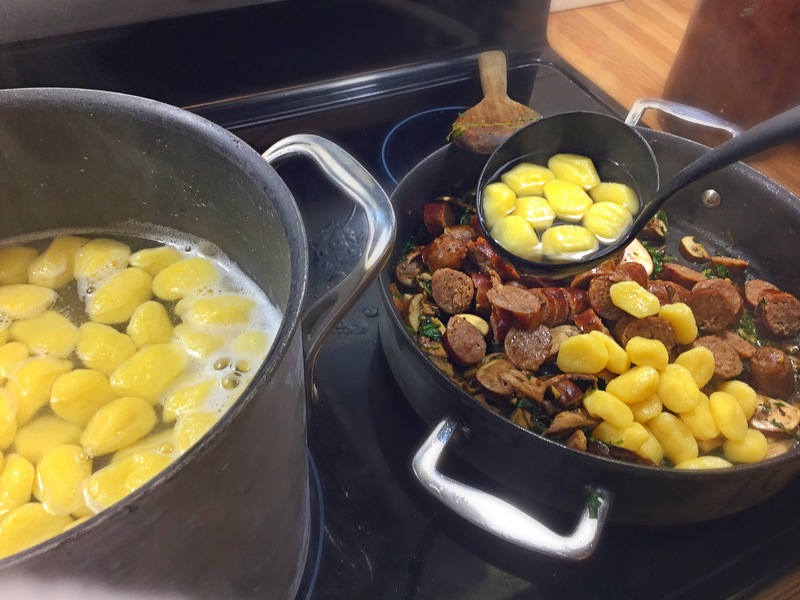 Make sure to include a little of the cooking water with the gnocchi! Really makes for a great sauce!! 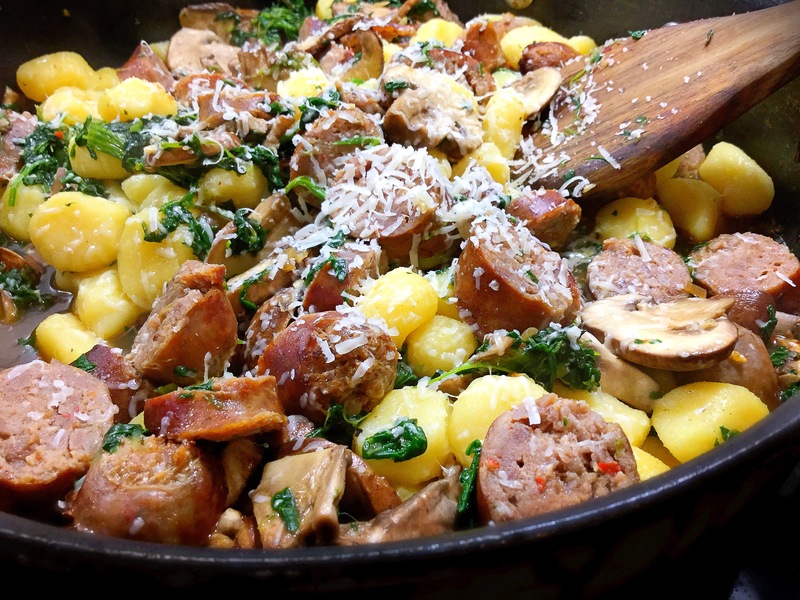 Finally…add that nutty parmesan cheese over top the entire skillet and fold in. Serve with a bit more freshly grated Parmesan on top alongside a light salad and glass of vino!! Enjoy!!! 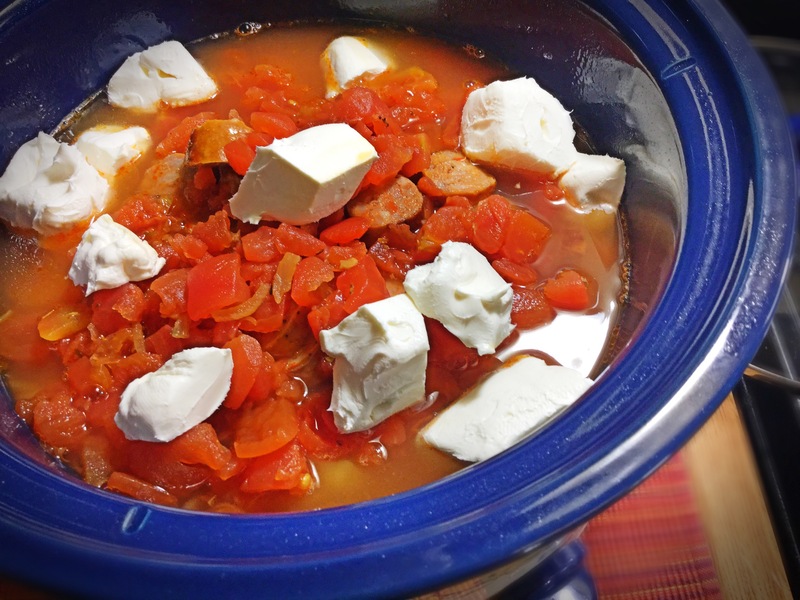 This is an all-time favorite recipe in my home on these chilly Fall (& winter) days. 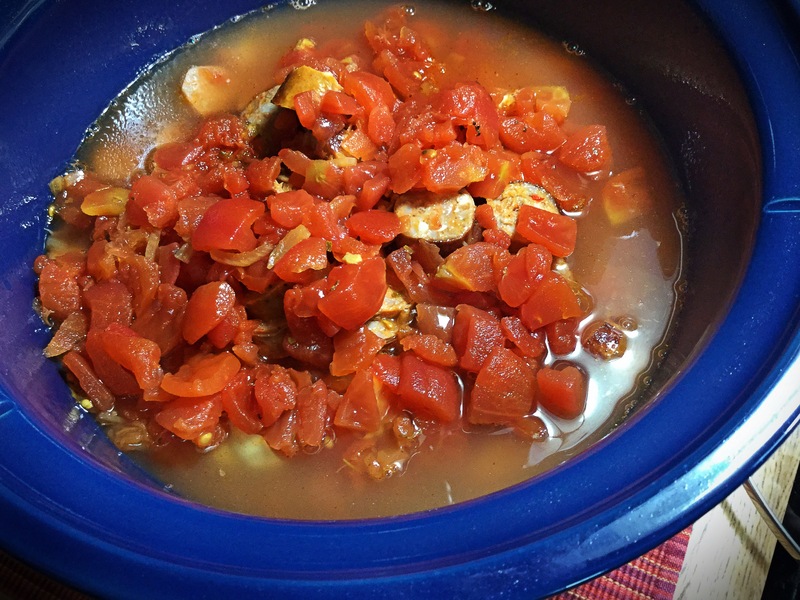 Now I cannot take credit for this classic crockpot meal delight, but it is SO easy, SO yummy and SO filling that if I can even reach just one person who has yet to taste this…my job is done. I’m happily passing the torch along from whomever made up this genius and simple meal! Besides cooking the sausage beforehand (for texture and sanitary reasons ;), this is a “throw it all in one pot” meal and walk out the door. You’re family will absolutely think you’re something brilliant! 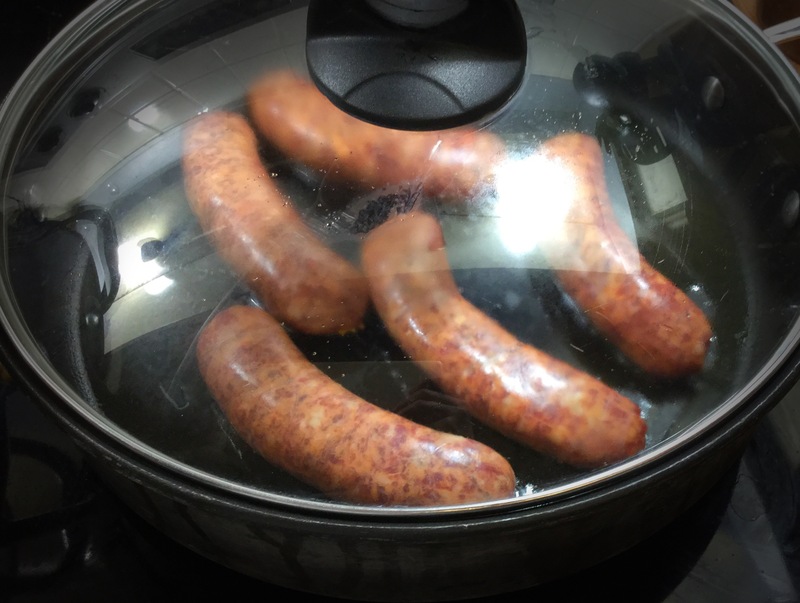 Starting off with the sausage…now to each their own here, but in my home we prefer ours cooked and sliced. This way adds a bit more texture and bite to the stew. 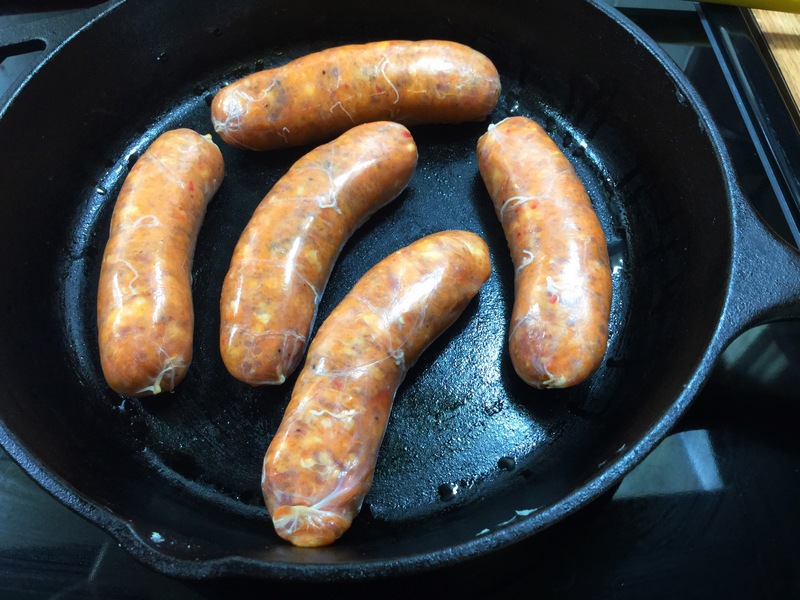 Alternatively, you can absolutely remove the sausage from the casing and cook as you would ground beef. The flavor will be the exact same..promise. 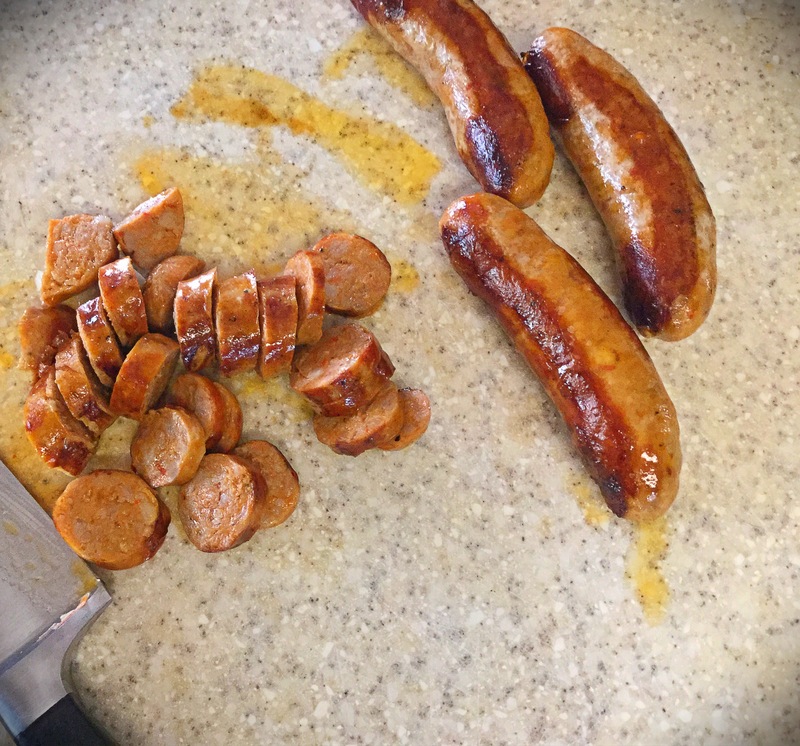 That all being said, I seared each side of the italian sausage hot links for a few minutes per side. I then took them off the heat to a cutting board and allowed to cool down (rest) for about 5 minutes before slicing up. 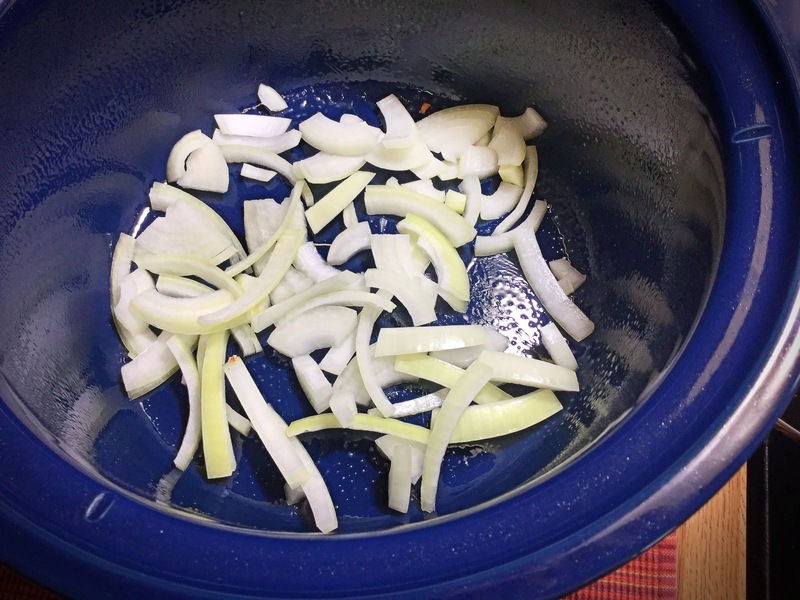 Next, coat your crockpot with non-stick spray (optional) and then lay the sliced onions on the bottom. Follow that with the rest of the ingredients. Layer the frozen tortellinis, cooked sausage, chicken broth, diced tomatoes, cubed cream cheese and then the spinach leaves. Stir together as well as you can (uncooked spinach can be a pain) then cover, set to low and allow the flavors to meld together for about 5 hours. 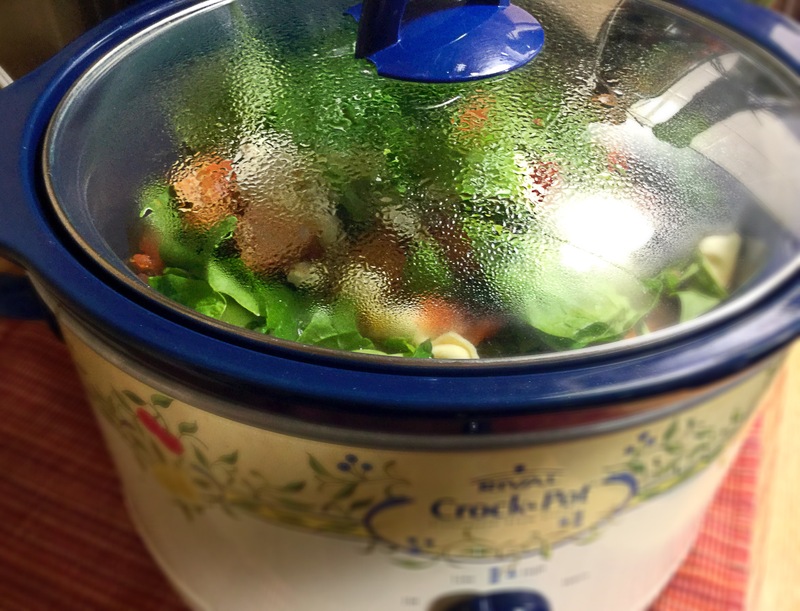 Remember, this is a crockpot, so if it is cooking away even longer on low, it is No.Big.Deal!! Once you’re meal is ready, I like to top each bowl with a bit of shredded parmesan cheese and serve with crusty bread and butter. Enjoy! *At times I will put just half of the bag of spinach in at first and then a couple of hours in I’ll stir in the rest (so it all fits)!.